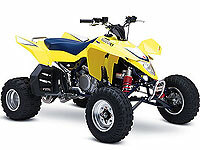 Since its release in 2006, the Suzuki LT450R QuadRacer has been one of the most successful race quads on the market today. It’s low profile and wider stance has helped make it an ideal choice for the motocross track, which is what Suzuki intended. GALLERY CT Racing LT-R450 MX bike. CT SUZ LT R450 Pipe kits. For all ATV front and some rear pairs.